The resistor added in this step is the 10kΩ one. For resistors with four coloured bands, like the one shown in the diagram, the first three bands of a 10kΩ resistor are normally brown, black, orange (in that order). The resistors added in this step are both 1kΩ ones. For resistors with four coloured bands, like the ones shown in the diagram, the first three bands of a 1kΩ resistor are normally brown, black, red (in that order). In this step, we’re connecting a simple sensor to detect the colour of the ground underneath the robot as it moves around. This sensor shines out infrared light, which is the same kind of light emitted by a TV remote control (it’s not visible to the human eye, but you might be able to see it if you look at the sensor carefully using the camera on your mobile phone). The sensor detects how much of the infrared light is reflected back from the surface under the robot. Dark surfaces (e.g. black) absorb more light, while bright surfaces (e.g. white) reflect more light. The voltage on the sensor’s blue output wire increases when more infrared light is reflected onto the sensor. 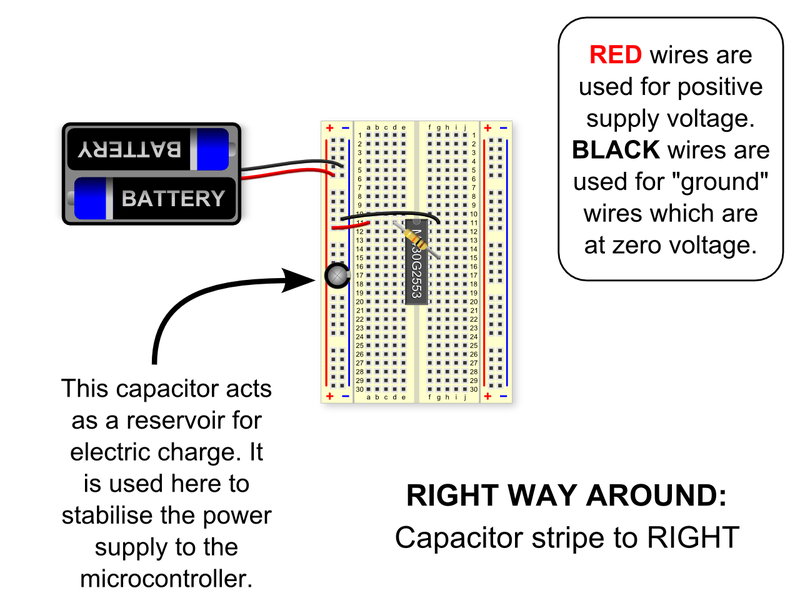 Note that the colour sensor we’re using in today’s workshop looks slightly different to the one in the diagram, but the three wires that connect to the breadboard are the same (red, black and blue). To get the motors turning, we need to program the microcontroller. 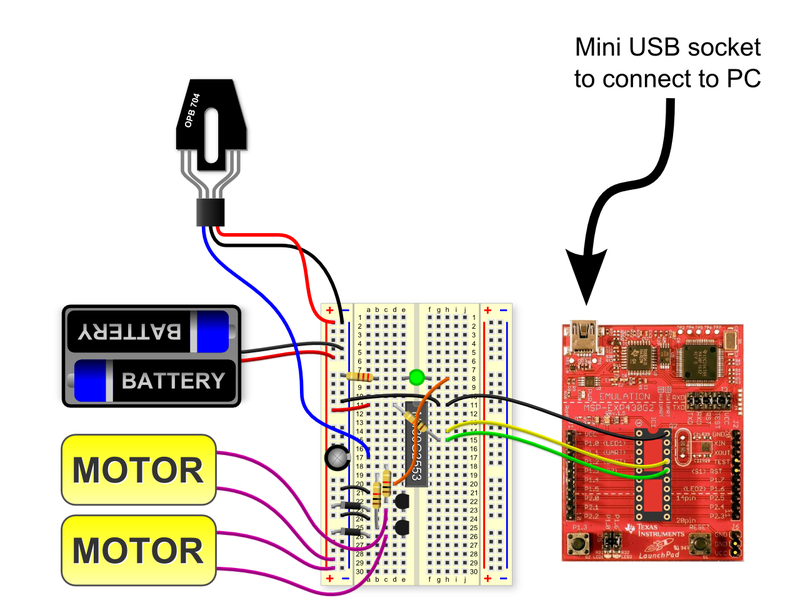 Go to the programming page now to learn about programming the MSP430. Can you elaborate on which resistors are used in step 3 and 5? (are you missing step 4?) The resistors are all colored the same on the diagram. I assume you were just using a generic resistor image. Thank you! Thanks Jim, well spotted! I messed up some of the numbering of the steps the last time I updated. I’ve fixed it now. The resistors in steps 3 and 4 (with the corrected numbering) are actually two different types, that just happen to have very similar colouring. On resistors with 4 coloured bands, the first 3 bands denote the size of the resistor and the last band denotes the tolerance (loosely speaking, how accurately the resistance of the actual resistor can be expected to match the stated value). For the first three bands, each colour represents a digit: black = 0, brown = 1, red = 2, orange = 3, yellow = 4, green = 5, blue = 6, violet = 7, grey = 8, white = 9. Incidentally, you may notice that most of them are in the same order as the colours of the rainbow. So, to read off the resistor value, the first two digits give you a number between 1 and 100. Then multiply that number by 10 to the power of the third digit. For example, the colour code of the resistor in step 3 is brown (1), black (0), orange (3), gold. That means that the resistance is 10 x 10^3 = 10,000. So, it’s a 10kΩ resistor. Similarly, the colour code for the resistor in step 4 (with the corrected numbering) is brown (1), black (0), red (2), gold. That means that the resistance is 10 x 10^2 = 1,000. So, it’s a 1kΩ resistor. 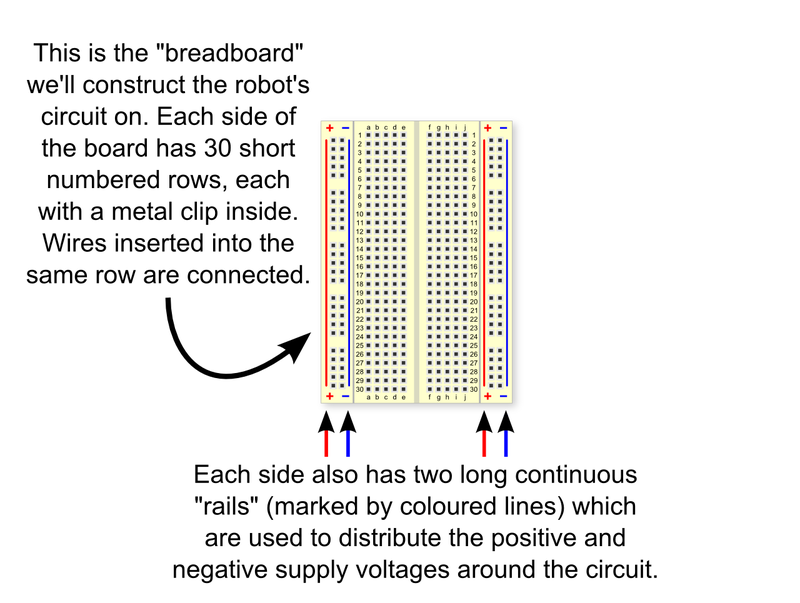 When I drew the resistors in the diagrams, I did use the correct colours, but unfortunately it’s not at all obvious which is which when I look at them now, unless I click on the images to see the larger versions and peer very carefully! I’ve added an extra comment above each image, but I’ll have to think about a clearer way to show this. In fact, I’ll have a chat with Damon about whether we should consider using the same value for all three resistors. A 1kΩ resistor would probably work perfectly well in step 3, but it would consume a couple of extra mA of current from the batteries whenever the robot is switch on.